I’ve decided to start posting anything I see that defies common sense and logic. There may only ever be a ‘Part 1’, but I seriously doubt it. If truth be told, i’m a bit annoyed I didn’t think of doing this sooner because there are literally millions of examples of stupid out there that I’ve simply rolled my eyes at and done nothing with. 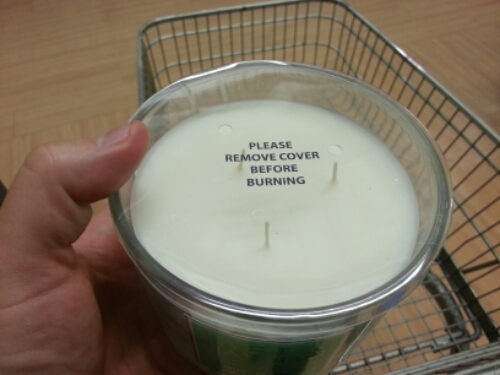 So here is the first (of many) that I saw on a candle in a supermarket yesterday. This entry was posted in Humour and tagged candle, common sense, dumb, stupid, supermarket, tesco by headinablender. Bookmark the permalink.